Ten Dollar Thoughts » Blog Archive » Who’s the Better Boss? I’m here to follow up. A few weeks ago I wrote a post about Manhattan’s niche industry of super high end nannies and mused about why some people will pay astronomical prices for childcare. I was responding to an article in The New York Times Magazine that discussed this topic and has since gotten quite a bit of national attention. Take, for example, this article from Slate’s Double X section in which experienced nanny L. Wood discusses why she would rather work for a rich family (specifically a rich mother) than a working one. * Wood comments that the obvious issue of compensation certainly factors in. But, rather, she believes it is the way that wealthy mothers manage their relationships with nannies and babysitters that makes them preferable employers. Specifically, they don’t have relationships with their nannies – according to Wood, that is. Perhaps I come to this topic defensively. Except for the fact that we did go through a well-reputed referral agency (rather than Craigslist or similar) to hire our nanny I am everything she described in a working mother. We went through a series of awkward interviews. We ultimately made a decision based on a gut feel. When our nanny was new to us and we were new to parenting I’m sure that I micromanaged her more than was warranted. And – at the heart of Wood’s position – we have a personal relationship with our nanny. It seems we’re everything she’d hate. So now that I’ve gotten my disclosures out of the way let me ask this: what’s so wrong with all of that? When it comes to babysitters I can see her point. They are there to keep your kids fed, amused, out of trouble, and put to bed for an evening here and there. They are paid hourly and if they are reasonably experienced there is no need to go through lengthy pre- or post-game rituals with them. But a nanny is different. This person is caring for your children on a daily basis for long periods of time. (I know of a family who had the same nanny for 12 years!) Nannies are working (and sometimes living) in your house for the majority of your children’s waking hours. What I don’t understand is why anyone wouldn’t want such an employment arrangement to come with some degree of personal relationship. Wood argues that, “Wealthy moms know how to manage their help because they have experience hiring, managing, and firing people in their homes.” She believes that this level of comfort with household employees makes them better employers because it affords them some degree of detachment from their nannies. While I would agree that someone well-versed in managing a household staff is better equipped to be a good boss, I wholly disagree that the detachment that supposedly results is any kind of asset. Any study that analyzes people’s job satisfaction tells us that one of the biggest indicators in whether or not people like their jobs is the relationships they have at work. This usually outranks even the work itself in measures of job satisfaction. In a professional environment the friendships and camaraderie that are built amongst coworkers are highly valued. Yet Wood seems to believe that such relationships come as a detriment. Taking this a step further, a nanny’s job is to help raise your kids for a portion of their lives. Certainly she should do so in accordance with the parents’ rules, values, and priorities. But she’s still shepherding them through life on a daily basis. In the same way that two parents need to communicate about their children extensively, so should a mother** and her nanny. Raising a child is a huge job and a collaboration. If a nanny is part of that collaboration in your family then shouldn’t there be more to a mother’s return home at the end of the day than, “You’re dismissed”? I don’t pretend that our nanny comes to our house every day out of the goodness of her heart. She comes because it is her job and because we pay her. Nevertheless every morning when I leave for work thank her. And every evening when she leaves our house we thank her. Perhaps this isn’t the way things are for most working adults. Come to think of it, I don’t think my current boss has ever thanked me for anything. But maybe that should be the way things are for more of us. How much happier might we all be if our employers told us on a regular basis how much they appreciate what we do? 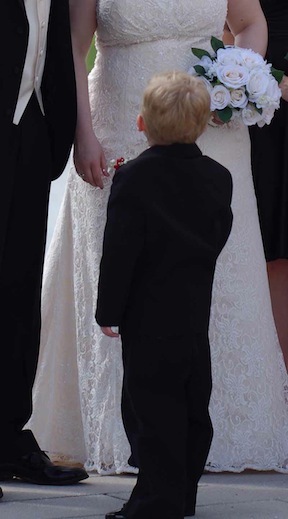 In my last post on this topic I mentioned that IEP was Nanny’s ring bearer when she got married last month. I couldn’t have imagined it any other way. And I’m pretty sure neither could she. And I know for certain that we’re both very grateful for that. *For the purposes of this blog post I will overlook the incredibly erroneous assumption that no working mothers are affluent, and that all stay-at-home mothers are. Clearly she’s never heard of Sheryl Sandberg. Nor has she, apparently, ever met a family that made financial sacrifices in order for one parent to stay home. **I don’t mean to exclude fathers here. But Wood limits her argument to mothers, so for the sake of practicality so am I. This entry was posted on Thursday, April 19th, 2012 at 5:00 am	and is filed under Culture, Parenthood, Relationships. You can follow any responses to this entry through the RSS 2.0 feed. Both comments and pings are currently closed. The whole issue of paid childcare / nannies is likely a touchy subject these days. Given the economy, those who can afford it (and avail themselves of the assistance) may be less likely to talk about it – in socioeconomically “mixed” company. Those who are affluent enough to not work and also have a nanny may feel squeamish in this economy as well – whether they fill their non-parenting hours with tennis and mani-pedi’s, or studying, volunteering, being part of various communities, etc. It’s interesting how things change. In my grandmother’s generation (and before), even those families of modest income nonetheless had some sort of assistance – a part-time housekeeper, someone to assist with cleaning, and so on. As for relationship “style,” I agree with you that relationship can make or break any sort of working scenario.